You could be a total stranger to me, but if you invite me to your wedding, I will bawl like a baby. Weddings are so beautifully charged with emotion, and the weight of the joy and love opens the floodgates in my eyes. Karl and I flew to Southern California last week to attend the wedding of our beloved friends, and it was so beautiful. I’d describe it to you all in more detail, but my tears would probably damage my laptop. I did post some pictures here. That incredible weekend in California felt like our final farewell to summer for 2015. The temperatures are now plunging, and my feet are struggling to stay warm (it’s actually an eternal struggle). I am retiring my window fan for the season and bringing my space heater back into commission. 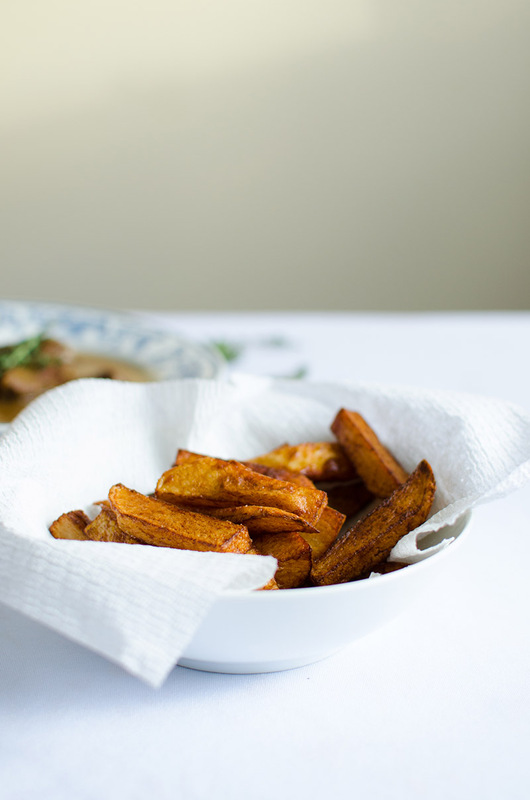 Soups and stews are making frequent appearances on our dinner menu, and I couldn’t be any happier about that. Without a doubt, my stomach’s favorite season is autumn. The markets are well stocked with gorgeous squashes and crisp apples, and delicious, warm scents fill the air everywhere it seems. Now that it’s October, the world is celebrating beer, and although I cannot stand to drink the stuff, I love using it as an ingredient in my dishes. 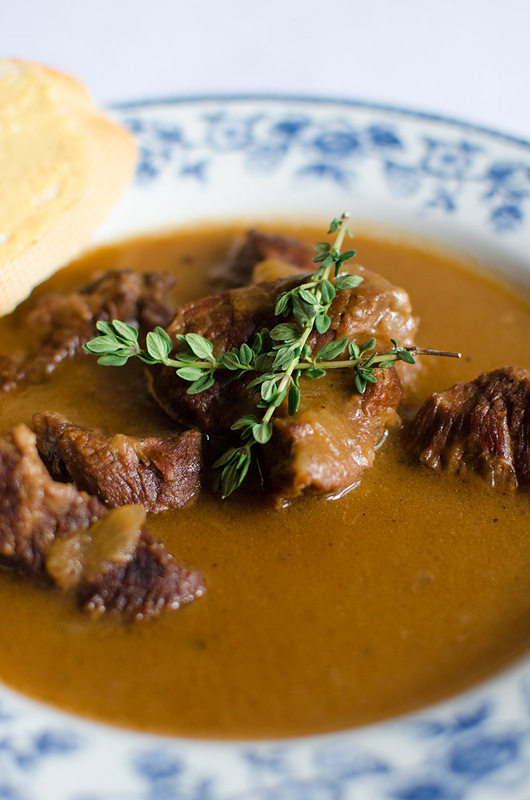 My little contribution to the start of autumn and Oktoberfest is this Belgian beef stew or carbonnade, a beef stew made with onions and beer. So I made carbonnade for the first time a few weeks ago, and it was adapted from Catherine’s beef stew recipe on Tastebook. Bram, the new post-doc in my lab who happens to be from Belgium, has given this recipe his seal of approval. I anxiously tapped my fingers, waiting for 90 minutes of simmering to go by. When it was done, Karl and I dug right in, with dijon mustard and slices of french baguette ready to go. Our eyes widen after one bite, and we looked at each other as if I had just discovered the cure to cancer. It was good. So good that it left smiles on our faces several hours post-meal. I let a few weekends go by before I made it again, and now the time has finally come for carbonnade again. This time, I’m sharing it with you all. This dish requires very few ingredient, which I really appreciate . The hardest step in recipe will probably be hunting down Belgian beer, but please use the real stuff. It’s worth it. And if you put Budweiser in this stew, I will cry, even more than I do at weddings. Which is a lot. So don’t do it – this means you DAD! 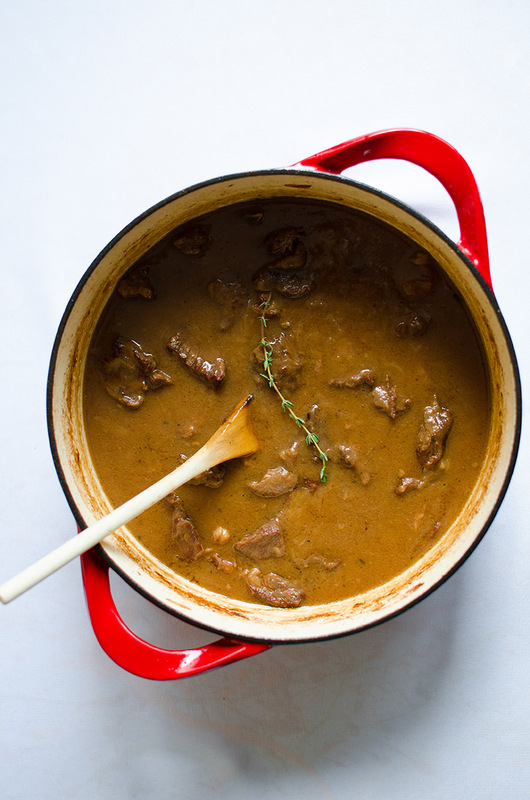 There are so many ways to eat carbonnade. You can have it with Belgian-style fries (I used a recipe found on Epicurious), egg noodles, and/or bread with dijon mustard. 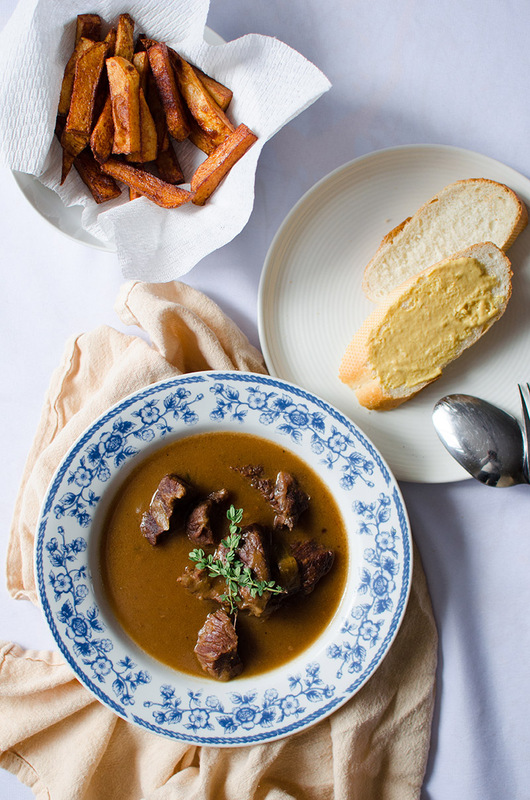 I was a little surprised by how well this rich stew went with bread and dijon mustard – it was like these two were always meant for each other. 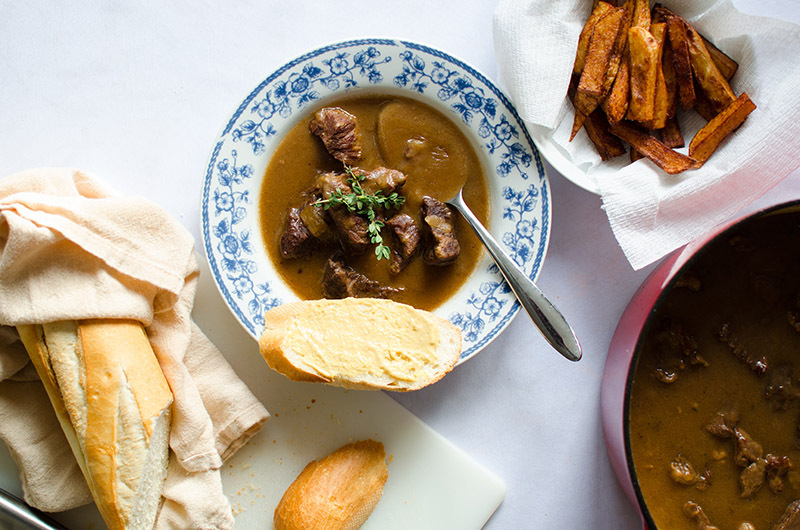 I cannot think of a better way to celebrate autumn than with this warm, cozy stew. Season the beef cubes with some salt and freshly ground black pepper. Heat up the olive oil in a 6-quart dutch oven over high heat. Sear the beef cubes, in batches to avoid overcrowding, in the oil for about 3 to 4 minutes, turning to brown all sides. Plate the beef, then set aside. Add the onions to the same pot, and cook for about 6 to 7 minutes, until the onions are soft. Season with a little salt and freshly ground black pepper. Add the thyme, bay leaves, beer, beef stock, ½ teaspoon salt, and ¼ teaspoon freshly ground black pepper. Bring to a boil, then return the beef to the pot. Bring to a boil again, then reduce to a simmer over medium-low or low heat. Simmer, uncovered, for 1 hour and 30 minutes, or until the beef is tender. Remove and discard the thyme sprigs and bay leaves. Stir in the red wine vinegar and light brown sugar. Whisk together the melted butter and flour, then stir into the pot. Simmer for another 5 minutes, uncovered. 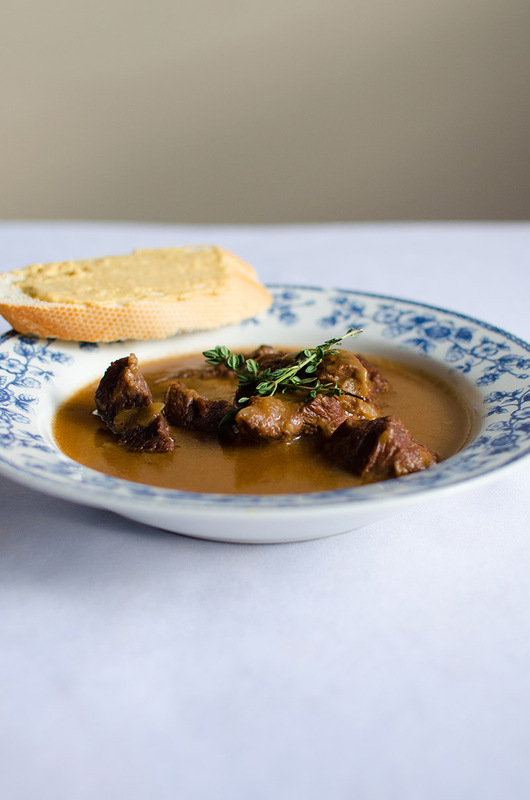 Ladle the beef stew into serving bowls/plates. 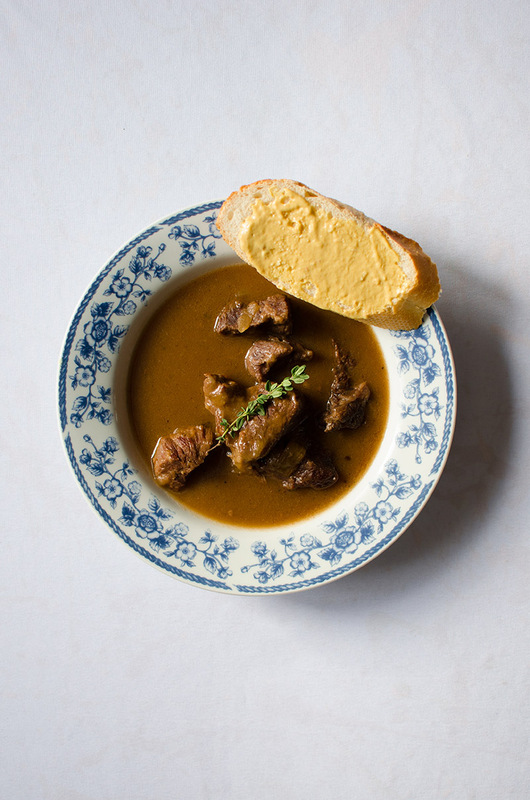 Spread dijon mustard over the baguette slices, and serve with the beef stew. 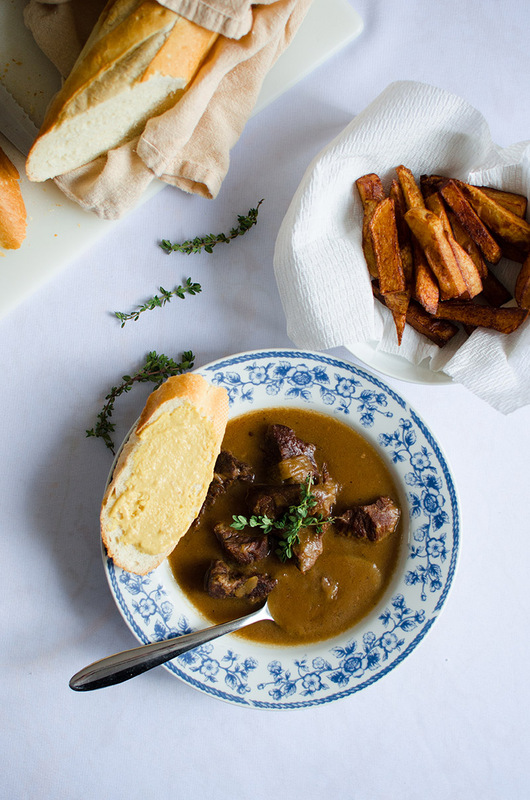 Alternatively or additionally, you can serve this beef stew with Belgian-style fries and/or cooked egg noodles. This entry was posted in Entrees, Soups and tagged bay leaves, beef, beer, Belgian, onions, thyme. My stomach’s favourite season would have to be autumn too, I just love all the hearty and homely dishes that can be created. Divine stew too! Wow, this looks super yummy! Perfect for colder weather 🙂 Thanks for the rec about using the Belgian beer. After I find some I might subs the butter for dairy-free margarine and then the Spork and I can try this too! I made this tonight n everyone loved it!! My neighbor even said he can smell it from the street n was wondering what I was making!! I sent him this link of course! !